Winter melon is a fast growing warm-climate Asian vine fruit that grows on the ground like a pumpkin does. It has a tough green skin on the outside but develops a white ashy wax over its skin as it matures. Hence, winter melon is also called a wax gourd or ash gourd. Winter melon is perhaps the largest cold season melon. It typically grows to at least 15 inches in diameter and weighing between 30 – 50 pounds each. Due to its large size, winter melon is typically sold in grocery stores in pre-cut bagged slices. Underneath the tough skin, winter melons have a thick white flesh that is mildly sweet, and a large seeded cavity. The water rich texture of winter melon flesh is similar to that of a watermelon, and becomes soft when cooked. Because of the wax that develops over its skin, winter melons have a long shelf life and can be kept for several months if left un-cut in a dry cool place. Winter melon is a long food staple in China, and it is used in a variety of ways including soups, braised stews, stir-frys, Chinese pastries, and candies. 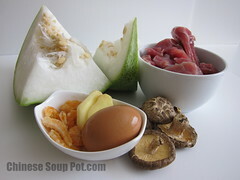 During Chinese New Year, winter melon is often dried, sweetened, and eaten as a traditional new year celebration candy. The “wife cake” or “sweet heart cake” (老婆餅) is a famous flaky thin-crusted Chinese pastry also made with winter melon. In Chinese medicine, the skin and flesh of the winter melon is considered a cooling food, known to release heat, detoxifying the body and ridding skin acne caused by excessive heat. Thus, this melon is very popular during the hot summer time. Although the skin maybe kept on during the cooking process (for its nutrients and cooling benefits), the melon skin is typically not eaten due to its chewy and tough texture. See a list of my soup recipes using winter melons. Look for whole or pre-cut slices of winter melon in the produce section of an Asian supermarket, or local farmer’s market. If buying the pre-cut version, look for ones with a clean, firm, white flesh. Avoid ones where the flesh has turned yellowish. This indicates the gourd has been cut for some time and not fresh. Pre-cut winter melon slices sold in stores will not last as long as a whole (un-cut) melon, and should be used within 3 – 4 days if kept in the refrigerator. Sometimes, small whole winter melons can be found in Asian supermarkets. Choose ones that feel firm, dense, and heavy. If you have a garden and live in warm climate, you can check out these winter melon seeds and try growing your own. Wash the outside of the winter melon. If the skin will be used in the recipe, use a knife to scrape the ashy waxy skin in a sink of water to clean it more thoroughly. Not all of the ashy wax will be washed off, but you will remove some by using a knife. 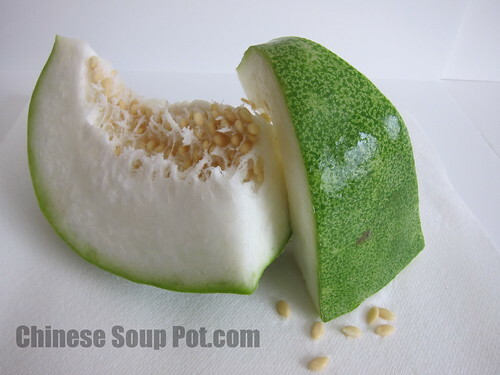 Since the winter melon is likely pre-cut when you buy it, just use a spoon to scoop out the seeds before cutting the gourd further for cooking. Wrap any unused portions with two layers of saran wrap and store in the refrigerator. A cut winter melon kept this way will be good for 3 – 4 more days. How do you use your Winter Melon? Leave a comment below to share your ideas. Just copy and paste the code below to your page. Resources and further reading: Specialty Produce, Ever Green Seeds. 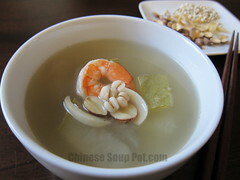 I’m really impressed with your website – everything is about Chinese soup! I’m married to a Taiwanese husband and when we started to live together back then, he was complaining why Japanese soup is always miso soup! Well, we change ingredients inside the soup but it’s miso soup….. I learned so much variation in Chinese soup (mainly eating out) and I hope to learn more from your blog!! My mum makes this soup and we love it. She makes it differently. Got to try making it your way the next time. Will be nice for a change. Hi Julie. Thanks for your visit and comment today! I don’t think I’ve ever seen winter melons at WF. But these are sold at a number of local farmer’s markets around the Bay Area in California. You can also check if there is a local store near you at 99ranch.com. And if you are into gardening, you can try growing your own with these seeds. I hope this helps. If you end up finding an Asian grocery store in your area, please feel free to post that info here to share with others.